Czech government-in-exile established in London under Dr. Benes. Hitler orders preliminary planning for invasion of Russia. Romania forced by Germany to give Dobruja province to Bulgaria. FDR asks Congress to extend the draft. US starts national aluminum salvage drive. France accepts Japan’s demand for military control of Indochina. Luftwaffe begins assault on Moscow with an air raid at night. Estonia, Latvia, and Lithuania join the Soviet Union under duress. US losses since the war began are reported at 44,143 killed, wounded and missing. Japanese invade Papua New Guinea, landing Buna and Gona, push south toward Port Moresby. US destroyers Monaghan and Aylwin bombard Kiska in the Aleutians unopposed. Some of the German defenders of the Brody Pocket reach German lines. Hitler gives permission to retreat from the Narva River to the Tannenberg defence line in the Sinimäed hills 20 km West from Narva. 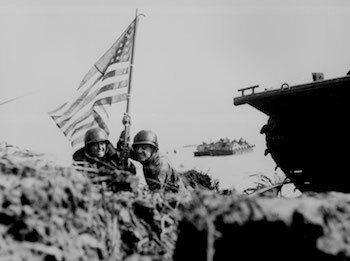 U.S. Marines land on Guam, establishing beach-heads up to a mile inland. The island is back under US control by August 10, but snipers continue to attack long after the war ends. The last Japanese soldier on the island does not surrender until the 1970s. Harry S. Truman was nominated to be President Roosevelt’s running mate at the Democratic National Convention. Six truckloads of art stolen by the Nazis is returned to Florence, Italy.